Since I have already tested my Y-DNA, I asked a male relative to take this Y-DNA test.Â This surname, Conger, is believed to have originated with a John Belconger who emigrated in 1665 from Great Yarmouth, Norfolk, England to Newbury, Massachusetts and later Woodbridge, New Jersey.Â Although there are likely many descendants of John Belconger in the United States, as far as I know there is only one other Conger who has undergone genetic genealogy testing, as discussed below. 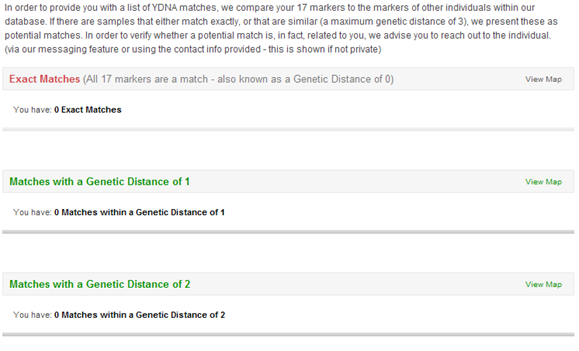 Since there were no results in the database, I entered the results into Ysearch to potentially identify matches (see Ysearch User ID 4KTQB).Â A search for matches with a genetic distance of 0 among people who tested at least 13 of the same markers turned up 19 matches, although none with the same â€œCongerâ€ surname.Â Outside of the United States, the most distant male ancestors for these matches are mostly from the U.K.
Interestingly, there is another Conger in the Ysearch database (User ID 4MSTZ), but his Y-DNA belongs to Haplogroup J2.Â With these two tests, therefore, we have shown for the first time that not all Congers in the U.S. are descended from the same man. Familybuilder also offers a â€œPrint My DNAâ€ and â€œShare My DNAâ€ features, which allow users to share their results with friends and family.Â The Share My DNA feature formats the results, for example, for easy posting to websites or social media such as Facebook.Â See the following link for a nice display of the Conger results. 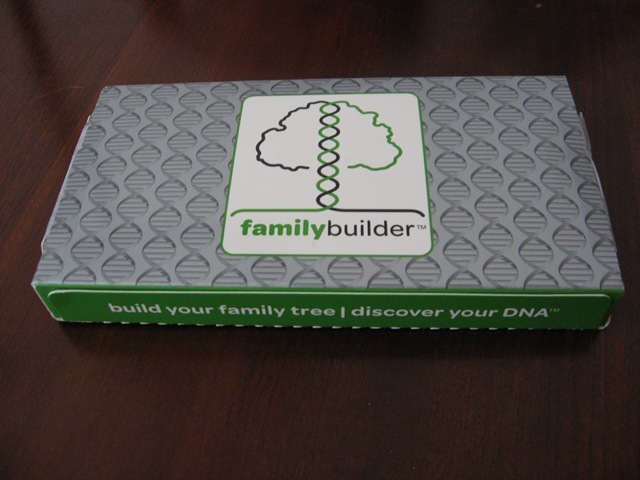 A Familybuilder Y-DNA test normally costs $59.95.Â Familybuilder uses a state-of-the-art laboratory facility with ISO/IEC and ASCLD Lab Accreditation for testing. You can follow Familybuilder on Twitter and Facebook. Interesting. My wife’s maiden name is Conger…we’ll have to get one of her brothers tested sometime. Thanks for the post! Thank you for this. I’m particularly interested in the fact that Family Builder would allow me to create a project that isolates descendants of George Hall of Taunton and Edward Hall of Rehoboth. These two families have been mistakenly entangled for centuries and DNA is finally assisting us in sorting these errors out. Unfortunately Family Tree does not make it possible to do this sort of specialized focusing so I will check out Family Builder. Makes so much sense–and is done at Rootsweb all the time.